Attack of the Friday Monsters! A Tokyo Tale is a life simulation game developed by Millennium Kitchen and published by Level-5. The game follows a boy named Sohta who lives in a town where monsters and superheroes from 1970s tokusatsu shows appear every Friday. It is part of the Guild02 series which is a compilation of three games designed by Keiji Inafune, Kazuya Asano, Takemaru Abiko and Kaz Ayabe. 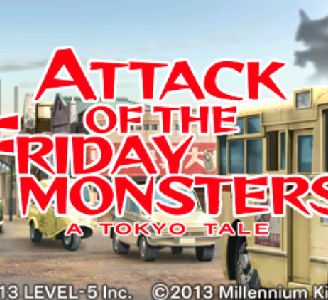 Attack of the Friday Monsters! A Tokyo Tale works well in Citra. The game runs great at full speed even on modest hardware aside from slightly choppy and slow FMVs.